There is nothing quite like cooking with fresh herbs…whether you are preparing a simple mozzarella and tomato salad garnished with fresh basil or an asparagus, potato frittata seasoned with fresh thyme. 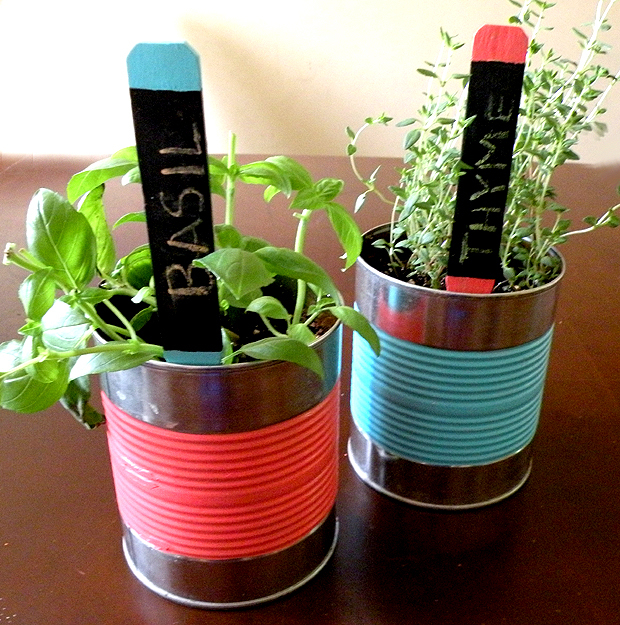 I like to have a small indoor herb garden in the kitchen for easy access when cooking and it also adds a nice decoration to the countertop Here is an idea I created for my indoor herb garden made from reused tomato cans and chalkboard garden markers I made. I love the rustic, reused look in the kitchen. I always find myself created something useful out of my larger cans. This project is easy and a great way to add a pop of color to your countertop. Step 1: Punch holes in the bottom of the can with a hammer and nail if you wish to have drainage holes. 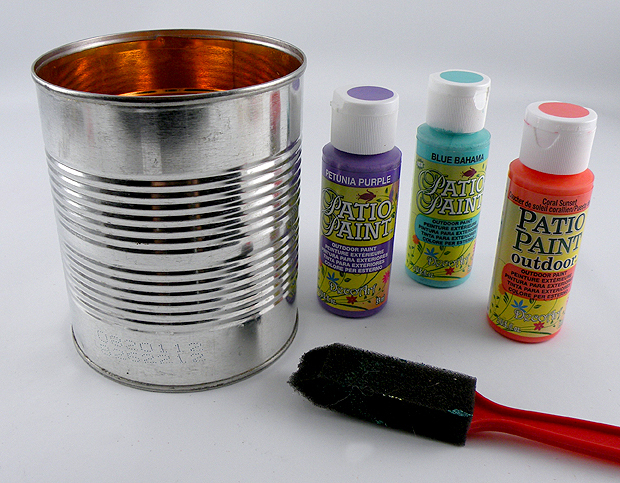 Step 2: Paint a band of color around the inner ridges of the can with a foam brush and let dry. Repeat with a second coat to intensify the color. Step 3: Plant your favorite herbs in the can. 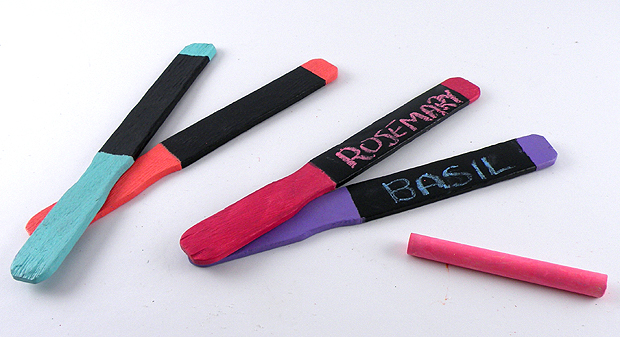 These fun chalkboard markers are perfect to use for you indoor herb garden or in your outdoor garden to identify different types of plants. Wooden stakes are painted with weather resistant Patio Paint to resist the elements so can be reused year after year. 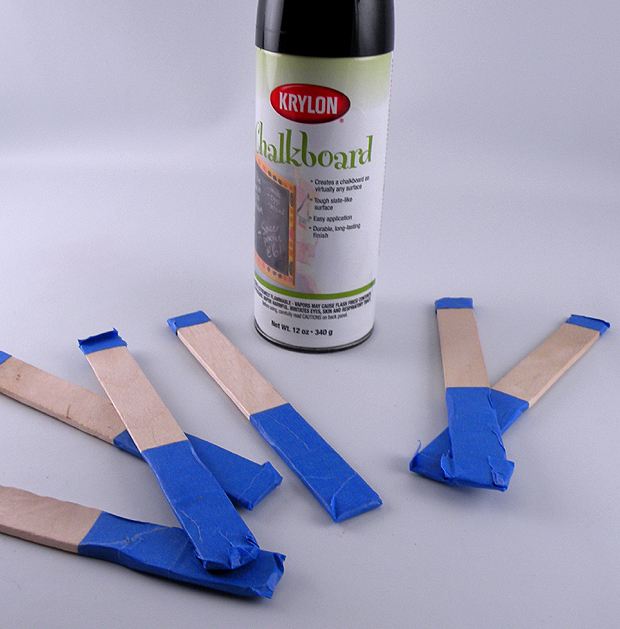 Step 1: Tape off about 1/4 inch of the top section of the wooden stick and the bottom 2″. 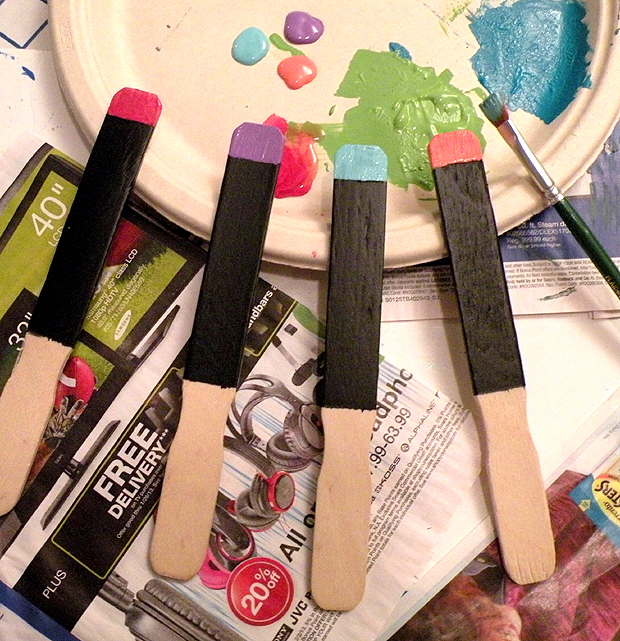 Step 2: Place the sticks on a paper surface or newspaper and spray one side with chalkboard paint. 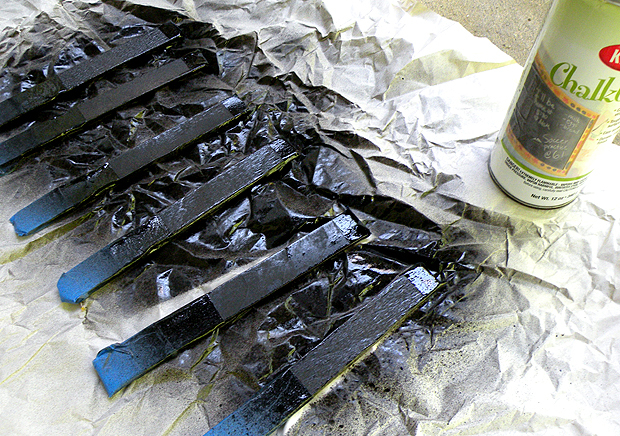 Step 3: I used 4 coats of chalkboard paint, allowing the sticks to dry between coats. It will give the sticks a thick chalkboard finish. Once dry, flip the sticks and repeat on the other side. 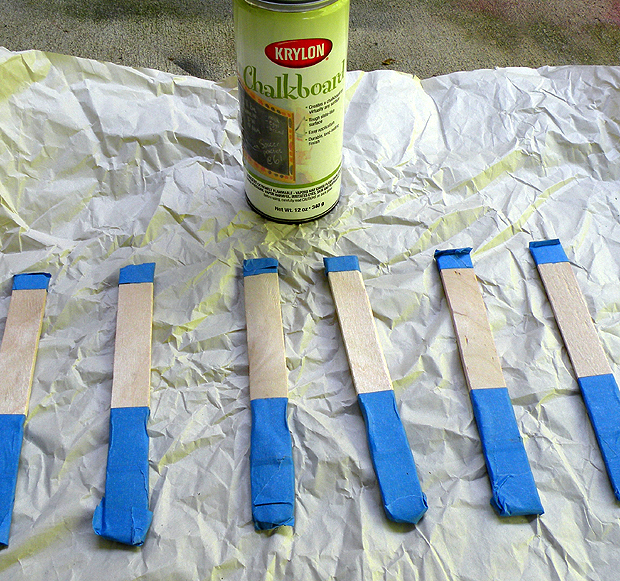 Step 4: Peel off the painters tape and apply two coats of Patio Paint to the top of the sticks. 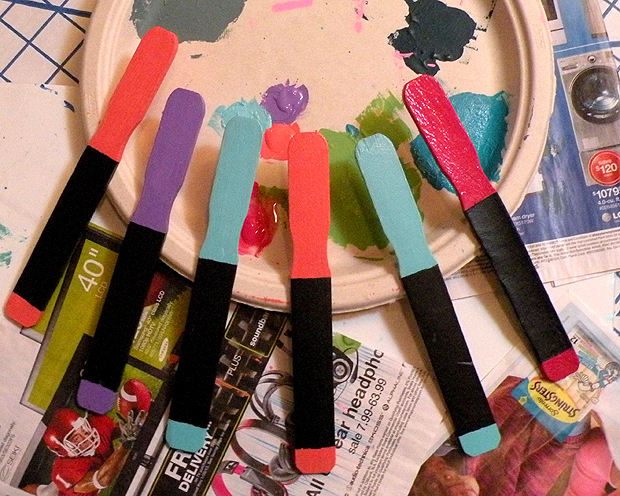 Step 5: Repeat on the bottom portion of the sticks with the matching colors as shown above. Use chalk to write the names of your herbs or outdoor plants. These are fun to give as a gift to the gardener or cook in your life. This entry was posted in Crafts, gifts, Mother's Day, Recycle, reuse, reuseable and tagged 28oz cans, chalk board markers, fresh herbs, garden markers, Gina Tepper, Herb garden, kitchen garden, outdoor paint, patio paint, reusing cans, wooden paddles, wooden sticks. Bookmark the permalink.